McLaren have launched their latest championship contender in a blaze of publicity that contrasts totally with the approach taken by Williams not long ago. Chris Richardson was there and questions the resoning behind the extravagance. Once in a while, it is a little unnerving to see such a blatant squandering of money on an event that, in the eyes of some other teams well enough able to flash their fat wads of Sponsorship wedge, appear a touch shall we say, over the top, proving that, like the Movies and Rock n Roll, the circus, commonly known as Formula 1, is just another branch of show business. Youll probably be told by Circus ringmaster Bernie Ecclestone and even McLaren Team Boss Ron Dennis, that this has always been the case ever since a Mr Colin Chapman struck a deal with Players cigarettes, and painted red and gold stripes down the side of his car, forever sealing National identities and Grand Marques under a multicoloured sea of tobacco, alcohol and petroleum logos. This financial disbursement on the part of companies eager to become associated with what was then, and indeed still is now, a glamourous white-collar spectator sport, has of course allowed Formula 1 to reach stratospheric heights of technological advancement. The canvas deckchairs on the airfields of a summertime England have been replaced with ubiquitous air-conditioned Motor Homes the size of tennis courts and the handlebar moustaches have long since disappeared, along with wire wheels and goggles. This is no bad thing when you consider the fact that you can sit bleary-eyed in front of your television at 4.30 am and watch a Grand Prix live from an amusement park some 12,000 miles away. To support Formula one in the style it (and we) has become accustomed, someone has to pay. The consumer in the final analysis will always foot the bill, yet motor racing proves a case in point that we can have our cake, and eat it . So, with the Gold, Silver and Bronze VIP passes , the sipping of Champagne with the stars, complimentary cigarettes and lighters and all the media attention they could want, the newly styled Team West Mclaren Mercedes consummated their marriage to new major German sponsor West Cigarettes in front of an invited audience of almost five thousand fans at the cavernous Alexandra Palace in London. 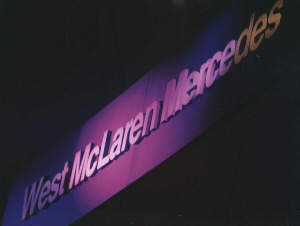 Fans, that is, of the Spice Girls who in suitably raunchy attire strutted their equipment in front of West McLaren Mercedes own equipment, which was swathed in blue laser light behind them. The car enthusiasts were there of course, members of the McLaren fan club. You could recognise them, because they were not dressed up as Spice Girl clones. 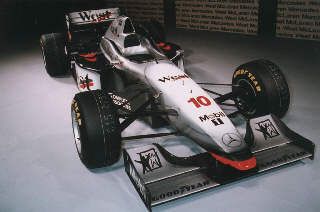 Indeed, the perennially popular voice of launch control, Steve Rider, was on hand to ensure that, West McLaren Mercedes cannot be ignored during the season to come. and that This was the livery that would identify and characterize the team well into the next century. The aforementioned wedding between West and Mclaren was announced at the cars unofficial launch last month when it appeared in an orange testing livery reminiscent of the early days of McLaren. As whirling rollerskaters, attired in the new look McLaren pit overalls, performed fast figures of eight under a billowing canopy of silver silk, the car emerged from the smoke and a shower of laser beams. It was indeed an impressive moment as the car revolved slowly, angled to the audience to reveal every intimate facet in all its splendour. Six multi-national graphic design companies were provided with a well defined brief to create the new team livery. The winning concept came from the London based design company Fitch, and was then optimised in partnership with McLarens own in-house graphics team. 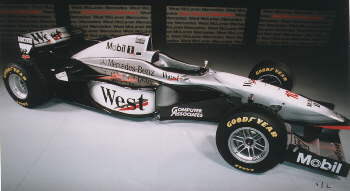 The rumours of the Silver Arrows was partly proved correct with the chassis carrying the traditional Mercedes colour and the sidepods were given to the black and white of the West logo. 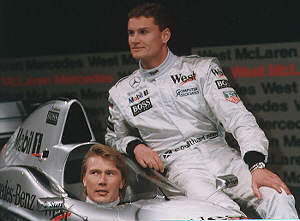 After enjoying a brief period as the most successful team in motor racing with 104 race wins, McLaren lost their way with three barren seasons that saw a change of engine supplier from Peugeot to Mercedes and the signing of Scotsman David Coulthard in 1996 to sit alongside Finn, Mika Hakkinen. Jean Alesi driving a Ferrari went and spoiled things for them by winning in Montreal in 1995 and Michael Schumacher, adding three more in 96, dropped them back down to second place. Three seasons without a win must sit very uncomfortably on Ron Dennis shoulders. As he said at the unofficial launch last month, "(I am) making a conscious effort to play down my own expectations. Im not going to make any predictions about the success of the car.." The car itself reflects the all out effort that designer Neil Oatley and his team have put into it. As with The new Jordan Peugeot, major redesigning has taken place. Both teams likewise are aware that their engine suppliers are looking for exceptional results and another unsuccessful season could jeopardize their chances of retaining engine supplies in the future. Mclarens recent tie-in with British Aerospace has guaranteed them the use of one of the finest wind tunnels in the world and has undoubtedly had an important effect on the look of the new car. As reported earlier on Speed Motorsport News, in line with the updated FIA technical regulations, the MP4-12 features a rear impact zone, collapsible steering column, reduced winglets areas and suspension designed within the limited aspect ratios designated by the technical regulations. The nose too, is unfashionably, 20mm lower than last years car. A newly packaged version of the longitudinal transmission introduced in 1996 will be in place for a second season and the cooling system has also been re-designed to capitalise on internal air flow. Successful testing has already taken place at both the Jerez and Estoril circuits and results certainly bode well for the season. Amid a frenzied throng of reporters at the informal press conference after the show, Coulthard said, We havent tested against Benetton but we are faster than Ferrari at the moment. Asked about the current Constructors Champion, he echoed most of the teams sentiments in stating that, Conservative money says that Williams will be the main force. This is not doubted by many and judging from the rush to re-evolve current models rather more drastically than last year despite protestations to the contrary, there could be more of a haggle for the podium steps than we have seen in recent years. In the relative peace and quiet of the West Hall with the silent images on giant video screens, of the Spice Girls strutting their stuff for the fans, Messrs Coulthard and Hakkinen pulled the silver sheet from a second car for the benefit of photographers. It was as expected, exquisitely turned out, and it did indeed look rather beautiful and full of purpose. However, all this ballyhoo and razzmatazz will not make the car any more mercurial and it remains to be seen how they fare on the track. Confidence and bravado were present in huge quantities and if teams like McLaren and Jordan Peugeot have got their act together as it seems they have, then Frank Williams will be given a run for his money that has been a long time coming.